Social media lit up on Tuesday with photos of Soleimani—the terror mastermind who is sanctioned by both the United Nations and the United States—speaking to a group of what appears to be soldiers in Hezbollah and Syrian Army fatigues. 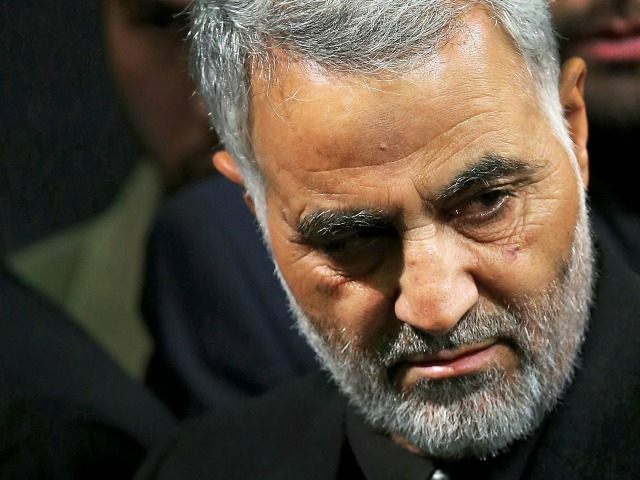 Soleimani has teamed with Iran’s proxy, Hezbollah, the Syrian Armed Forces under Damascus dictator Bashar al-Assad, and Russia, with plans to wage an assault on anti-Assad forces throughout the country. The Iranian troops will join a coming ground offensive against Syrian rebels in Aleppo, a city that remains divided, with the U.S.-backed Free Syrian Army entrenched in constant fighting over the area. Notably, the presence of the Islamic State (ISIS) terror group in Aleppo is still limited. The pro-Assad coalition, especially Russia, has carried out most of its attacks on Syrian rebels that are not aligned with ISIS. Assad’s forces control most of the city’s western areas, while rebel groups control the east. Experts have previously warned that there were around seven thousand Iranian troops already in Syria. “The decision to launch the battle of Aleppo has been taken… It is no longer hidden that thousands of Iranians are now in Syria and their role is fundamental,” a second official described as “close to the Syrian government” told Reuters. Meanwhile, Iran continues to suffer major casualties in its attempts to prop up the Assad regime. On Tuesday, two Iranian generals were killed during fighting between pro-Assad forces and Syrian rebels in the city of Homs. Iranian state-media reported that the two were engaged fighting against Islamic State forces, yet Homs remains an area that does not have a significant ISIS presence.